Monitoring tools are used to continuously keep track of the status of the system and send out alerts and notifications if anything goes wrong. Also, monitoring tools help you to ensure that your critical systems, applications and services are always up and running. Monitoring tools are a supplement for your network security, allowing you to detect malicious traffic, where it's coming from and how to cancel it. Monitoring Servers, Databases, Applications, Network Devices, Vmware hypervisor, Virtual Machines and much more. Special designed to support small to large environments to improve the quality of your services and reduce operating costs by avoiding downtime. Fully open source, so you don't need to pay anything. Provide user friendly web interface to do everything from a central location. Comes with SNMP to monitor Network device and IPMI to monitor Hardware device. Web-based front end that allows full system control from a browser. 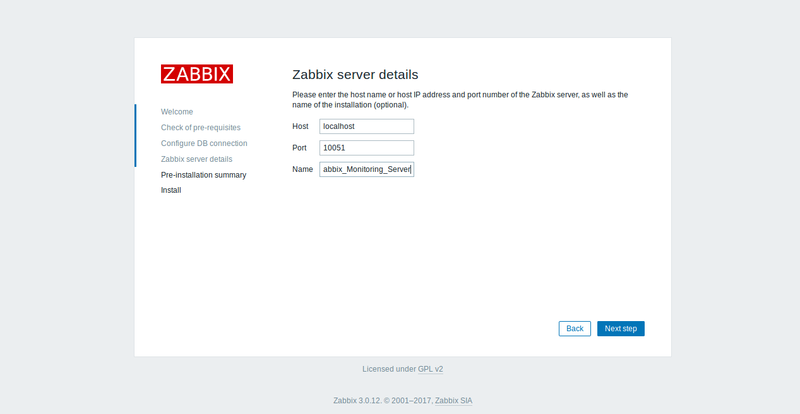 This tutorial will walk you through the step by step instruction of how to install Zabbix Server and Zabbix agent on Debian 9 server. 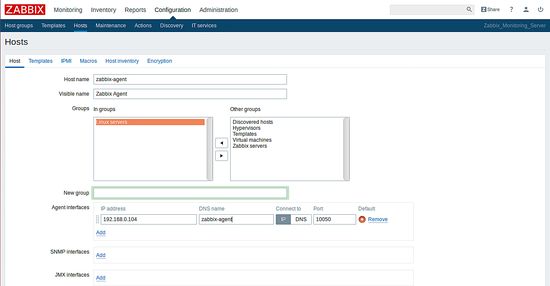 We will also explain how to add the Zabbix agent to the Zabbix server for monitoring. Two system with Debian 9 installed. Minimum 1 GB of RAM and 10 DB of disk space required. Amount of RAM and Disk space depends on the number of hosts and the parameters that are being monitored. Next, restart your system to apply these changes. Next, you will need to add MariaDB repository to your system. Because, latest version of the MariaDB is not available in Debian 9 default repository. By default, MariaDB installation is not secured. So you will need to secure it first. You can do this by running the mysql_secure_installation script. The above script will set the root password, remove test database, remove anonymous user and Disallow root login from a remote location. 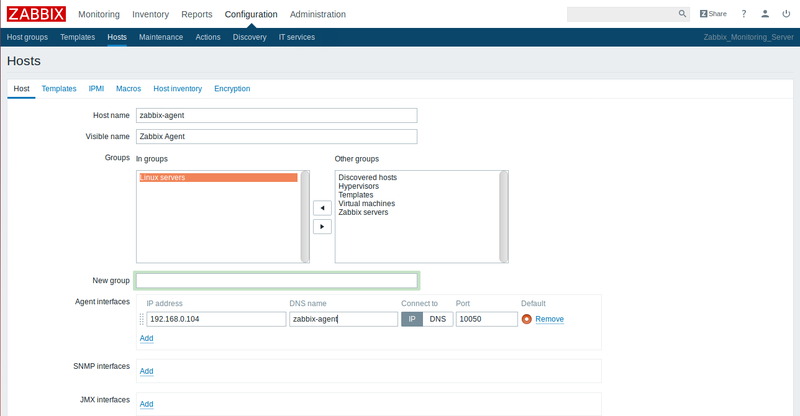 Before proceeding, you will need to configure the UFW firewall to secure Zabbix server. 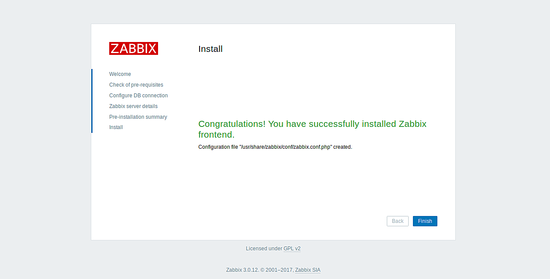 Once the UFW firewall is configured you can proceed to install the Zabbix server via web interface. 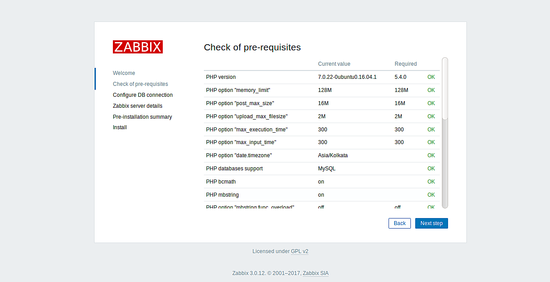 Once everything is fine, it's time to access Zabbix web installation wizard. 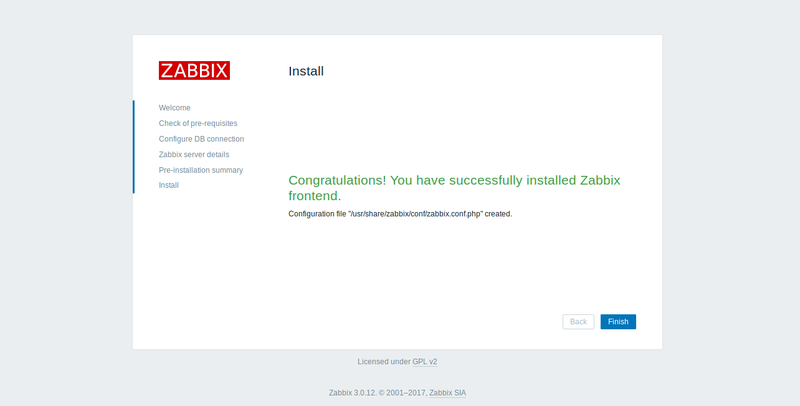 Your Zabbix web installation is now finished. Now your Zabbix server is up and functioning. It's time to add Zabbix agent node to the Zabbix Server for Monitoring. 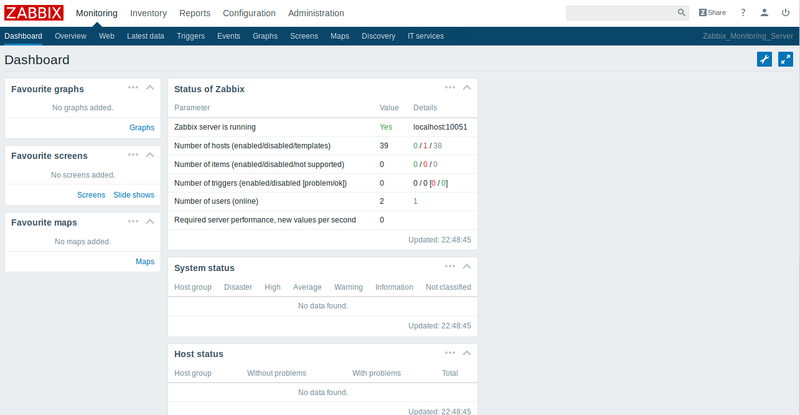 Next, you will need to add the Zabbix agent node to the Zabbix server for monitoring. First, log in to the Zabbix server web interface. Finally, click on Add button again. You will see your new host with green labels indicating that everything is working fine. 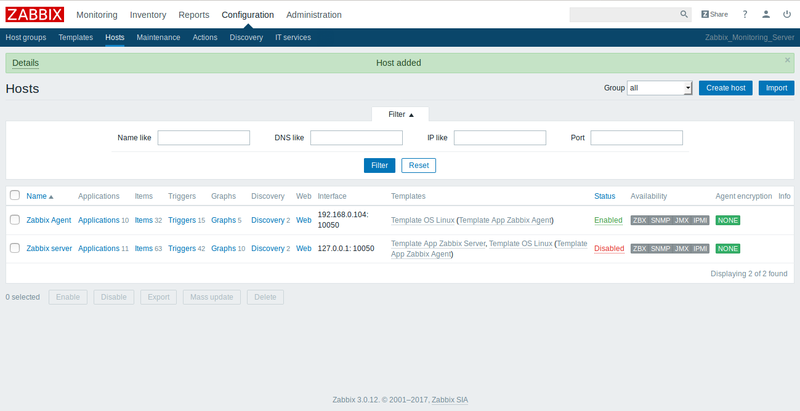 If you have extra servers and network devices that you want to monitor, log into each host, install the Zabbix agent and add each host from the Zabbix web interface. Congratulations! you have successfully installed the Zabbix server and Zabbix agent in Debian 9 server. You have also added Zabbix agent node to the Zabbix server for monitoring. You can now easily list the current issue and past history, get the latest data of hosts, list the current problems and also visualized the collected resource statistics such as CPU load, CPU utilization, Memory usage, etc via graphs. I hope you can now easily install and configure Zabbix on Debian 9 server and deploy it on production environment. 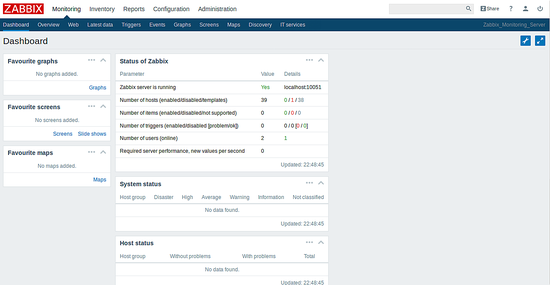 Compared to other monitoring software, Zabbix allows you to build your own maps of different network segments while monitoring many hosts. You can also monitor Windows host using Zabbix windows agent. For more information, you can refer the Zabbix Documentation Page. Feel free to ask me if you have any questions. "GRANT ALL PRIVILEGES on zabbixdb. * to [email protected] identified by 'password';"
Thank you for the notice. I've fixed that. I changed the create user statement to zabbixuser instead as the author is using zabbixuser in all other locations incl. screenshots. Sounds good. Might be worth mentioning that when editing the '/etc/zabbix/apache.conf' file, the PHP changes need to be made to the PHP 7 section ( the default on Debian 9 ) as there is also PHP 5 section with the same parameters in the file. PS: Great tutorial - everything is working well for me. Why is it necessary to add Mariadb repository? Zabbix manual says requirement is "MySQL 5.0.3 or later". Debian Stretch has MariaDB 10.1.26, which is later althoug the version numbers between MySQL and MariaDB do not match. Looks like the Zabbix repo used has Zabbix 3.0, and Debian Stretch already has Zabbix-server-mysql 3.0.7. Why is it better to install Zabbix from outside of Debian? 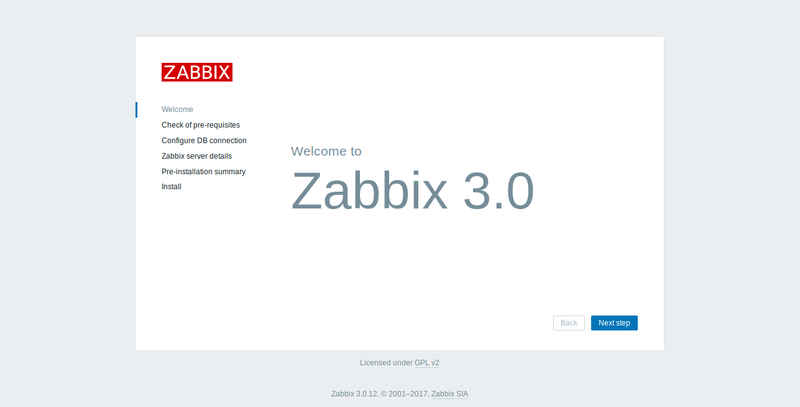 I have not installed Zabbix yet, just found out about it and discovered this fine tutorial. Hey, I get the following error "Cannot connect to the Database / The frontend does not match Zabbix database. 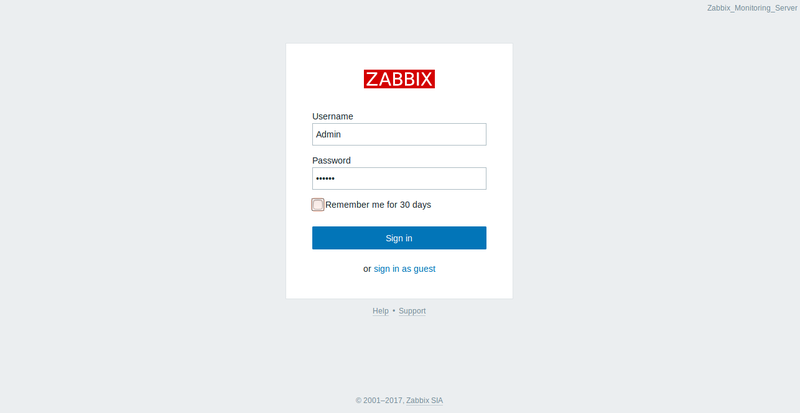 The Error I get at the Step "Accessing Zabbix Web Installation Wizard" When I try to log in. For newer instalations of MariaDB to access mysql you should run mysql -u root -p as sudo, otherwise you'll get "Access denied for user [email protected]"
Who is the disabled host?